Submitted by Oldroser on Sun, 06/06/2010 - 05:59.
lmcshane your input from the perspective of one who has done landscape work is so useful. The disadvantages as well as the advantages need to be considered. The golden raintree is beautiful indeed, and if planted on your property where you can mow over the many, many seedlings it produces there is no problem. But what if they are blown on the wind to your neighbor's patio and pots of roses and so form masses on sidewalks? I would like to hear from people interested in the herbal underplantings I suggested and in the ideas of plantings that produce food. When I lived in Okinawa, the Okinawans used the land between the fence of the airbases and the roadways to farm. I wouldn't go that far but I thought that since the Amish make ground cherry pie from ground cherries, we could also make use of them. I've read they grow wild in ditches. I'd like to hear from "birders," since most rugosas produce large hips which the birds appreciate, and the birds may like the thickets the roses make later on. I don't collect the hips for tea myself, just buy rose hip tea at the West Side Market, but I have read that during WWII roses hip tea was used as a source of vitamin C in ration-starved Britain. Always assuming they knew about it, wouldn't people be interested in seeing even a short stretch of roadway so planted? If it were more widely done, and I am certainly not against lilac which I love dear, and one man I was talking to brought up the idea of honeysuckle, a weed to some, a loved plant to others, on slopes, wouldn't it make visiting Tremont more attractive? Wouldn't it give us a certain favorable renown? Or at least a psychological lift. I suggested that it could be used by schools for botany study. Educators, is that feasible? dbra thank you for your kind comment. Tell me, what rugosas do you have planted? And do you live at the end of W. 11 where one turns and follows the path of the highway? When I was healthier, my dogs and I would walk that far and I saw what I thought was a rugosa. I'm glad you agree with me that they are practically carefree. And lavender! I think I left it out, but I plant it also. 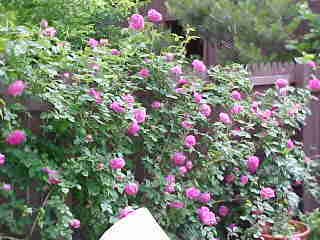 When I walk along W. 11th I see many beautiful roses and lovely front gardens. I see them on Scranton from my car, too. There are many gardeners here, but I think many are elderly and don't use the internet. I would like to hear from gardeners that are on the internet, of any age. And Norm Roulet I was stunned to see my roses as your header with a credit to me and a full photo of the "bouquet" I sent you. Well, you deserved it, being so prompt and helpful. I always try to give credit, as you did, and praise where due, that's to offset all of my "constructive criticisms." Submitted by Oldroser on Sun, 06/06/2010 - 10:17. Submitted by Norm Roulet on Sun, 06/06/2010 - 10:36. Reimaginaing Cleveland as a mosaic of real people already here already being special, like you. I have a sample of a local product created by Sansai called Miracle Dust that is supposed to make plants grow like crazy - would you like to test it on some of your roses... I'd like some expert opinions on the stuff... it seems pretty cool to me. Let me know and I'll bring some by - I'd love to see your garden. Submitted by Gone Fishin on Sun, 06/06/2010 - 10:45. I would love to see your garden too. Who is bringing the rose hip tea? Submitted by Norm Roulet on Sun, 06/06/2010 - 10:53. My Shaman friend says catnip tea is very soothing, as well. Submitted by jerleen1 on Sun, 06/06/2010 - 11:22. Down in the hills, everybody has catnip growing in their gardens, it severs a number of purposes and you're right cats love it. Last year I had some growing in a planter and every cat in the neighborhood got all frisky. My one big lover boy cat would climb right in the planter and lay down in the middle of the catnip and stay for hours. Submitted by Oldroser on Fri, 06/11/2010 - 08:13. I would love, love, love to have some of their product. Gardeners put used coffee grounds on the soil because the worms love it. The worm's leavings really enrich the soil. But I had read in the paper that the company filed for bankruptcy, and certainly you can do business even under those conditions, but I'd read that they were locked out of the building! The whole thing seems so great all the way around. And I think I read that the Cleveland Clinic was giving them their food waste, still another great way to recycle. Retro use of old building, employees people in the inner city, recycles, end result a wonderful product. Where did you read about Sansai? Submitted by Norm Roulet on Fri, 06/11/2010 - 09:22. I know they are dealing with some issues but I'm sure they are still maintaining operations as they have 60 million worms to protect. The last time I heard from them they were taking care of business - I have a bag of their casing product Magic Dust if you want to try some out - I'd love an opinion from an expert. Email me at norm [at] realneo [dot] us on where to drop some off and I'll check out your roses. Submitted by Oldroser on Sun, 06/13/2010 - 19:32. Submitted by westward on Sun, 06/06/2010 - 22:40. I would love to see the roses! I find the white rose with the pink/red stripe amazing. Is it possible to take a cutting? I am running out of space for plants. I would make room for that one somehow. When I looked up rugosas, I saw that these have been used elsewhere in other states DOT plans. Listen up, ODOT, and learn. Submitted by westward on Fri, 06/11/2010 - 22:44. For a lovely visit! I enjoyed the education about the roses, and I loved the visit with your dogs. I am impressed with how many plants you have, and I appreciate your generosity in sharing some of those with Lily and I. I look forward to your visit to my yard. I am currently doing battle with a squirrel over my finch bird feeder. He is probably the same one that I fed over the winter and sees the feeder as a treat just for him. I created a baffle today out of a plastic milk jug. All my bird books say that squirrels figure out how to overcome baffles. I have enjoyed the goldfinches and the purple finches as this adds to the yard, but I may just have to give the expensive "squirrel treats". Submitted by Gone Fishin on Fri, 06/11/2010 - 23:00. Your flowers are beautiful and you are a sweetheart! Submitted by jerleen1 on Sat, 06/12/2010 - 00:10. Meet my little friend Betsy. She comes every morning and every evening and then sometimes, she stays all day. As you can see from her rest she's taking after a belly full of peanuts. I bought a bag of mixed squirrel food - and she does not like anything except the sunflower seeds. You'll notice that she dumped it out so she could sort out what she liked. She knows where I keep the peanuts so sometimes if I have the door open, she just comes in and helps herself. She's had about three litters and recently one of her last babies comes along. Sometimes I open the patio doors in the morning and if I drift back off to sleep, she comes in and pulls on my blanket or scratches my chair letting me know it's time to eat. She's cute fun and has a lot of attitude. If I'm doing something and not paying attention to her, she sits on porch rail, starring at me squaking and wagging her tail like she means business. She loves apples, peaches and also has a sweet tooth. She really likes chocolate chip and banana nut muffins. Submitted by westward on Sat, 06/12/2010 - 00:22.
and get that squirrel spayed! My bird book advises a separate squirrel feeder and also advises not to feed them sunflower seeds as this will help them favor birdseed. During the winter, one of the treats was peanut butter on whole wheat topped with sunflowers seeds so I am paying the price for this now. My squirrels are happy to receive peanuts. They promptly bury them for later, and return to the birdseed. I keep telling them that down south they would be in a pot simmering on the stove, but do they listen? Spay and neuter these squirrels. Submitted by jerleen1 on Sat, 06/12/2010 - 20:29. Oh you are so right. But the sunflower seeds are mixed in with the squirrel mixture and she just out right is not going to eat anything but the sunflower seeds. I went today and loaded up on the peanuts - although she should have enough burried to last awhile. I came home the other day and she had pulled out aall of my flowers to burry the peanuts. As far as cutting off their works, it cost enough to get the cats spayed and neutered. I'm going bankrupt buying bird food, cat food, peanuts and squirrel food not to mention keeping enough to feed all the youngin's that drag in on a regular basis. They're all spoiled. Even the pigeons recognize my old pink jeep and line up on the power wire when they see me coming. I also love to watch the butterflies. I do enjoy the animals. It takes Betsy a little time to warm up to others though. She just recently started eating out of my granddaughter hand and not running for cover when she sees her coming. Animals and children are the best judges of one's true character. Submitted by westward on Sat, 06/12/2010 - 21:23. I do not hand feed any wild critters. The squirrels (I try to say one but when they show up in hordes, it is hard to deny) would watch for me during the worst part of winter for food. I do not feed them in the spring, summer or fall (not including the bird feeder). I did have a baby squirrel imprint on me a couple of years ago and would follow after me, and try to involve herself in what I was doing. I was not amused and ignored her. This went on for months and she finally got the message, or a boyfriend. When we hand feed wildlife, we are 1) telling them that they can trust humans, and they can't, and 2) discouraging them from learning how to survive. I don't have a problem with supplementation when nature, or humanity, has turned against them. I would never eat them, either, though I did say otherwise today to the squirrel trying to figure out how to do away with the baffle. He did not seem threatened what so ever. Cats can be spayed or neutered when they reach 18 ounces. Microsurgery is common these days. I do not know of any veterinarian who would take a request to do this to a squirrel seriously. Submitted by jerleen1 on Sat, 06/12/2010 - 22:40. I don't think many people would eat the little red squirrels. Down in the hills, they eat gray squirrels. Submitted by westward on Sun, 06/13/2010 - 15:31. She figured out the baffle and destroyed part of the new feeder. She is a red squirrel. I did have a gray squirrel over the winter. He was a regular, but when the hard month of February passed, he disappeared. He was the first gray squirrel that I have seen in the neighborhood. Submitted by noner on Sun, 06/13/2010 - 18:36.
you need our Zippy Do Da Day... she was after that squirrel this morning and he kept running to the cherry tree and knocking off cherries for the chikens... oh one day she'll get that squirrel... but then we're moving back. I said - oh you just wait until our dogs get home... your days are nUMbered! Submitted by westward on Sun, 06/13/2010 - 22:56.
and there are numerous trap and release activities going on. It has a real impact on reducing the cat population that people created to begin with. You have a neighbor who is into this, Debra, but I can't remember her name. So much more humane than a dog torturing a cat to death. Submitted by noner on Mon, 06/14/2010 - 08:41. (!!?!!) I'm assuming the cats will stop lounging in the garden when there are 3 huge dogs living there? and they may not be strays. none have collars, but they're not skinny either. Submitted by westward on Mon, 06/14/2010 - 11:09. You are one of the last people that would let this happen. I am still reeling from the pitt bull attack on a cat. I am sorry that I am implied that your dogs would do this; your cat puts them into their place. Submitted by noner on Thu, 03/24/2011 - 19:41. Submitted by jerleen1 on Sun, 06/13/2010 - 18:53. Those damn little fixin's. I came home today and they had ripped everyone of my freshly planted flowers right out of the pots. Looks like they were playing baseball with them. Dirt is everywhere. Although I did find some peanuts burried in the pots. We're going to have to have a talk. Submitted by noner on Sun, 06/13/2010 - 18:55. Submitted by westward on Sun, 06/13/2010 - 23:09. Jerleen, you say that you went out yesterday and loaded up on peanuts, then today post that the squirrels dug up all your plants. I think the this is a form of communication and you are being told to bring out the sunflower seeds. I have several sunflowers growing. The heads are just beginning to form. They will be history in a month. I am getting a metal pole somewhere and hanging my feeder from that. I am going to outsmart this squirrel yet. Submitted by jerleen1 on Mon, 06/14/2010 - 09:08.
good luck - they seem to be smart little critters and.........with a lot of nerve. Submitted by westward on Tue, 06/08/2010 - 23:19.
go together! They are short enough that you can teach them to dig out weeds from under the bushes. I'd love to see your gardens, Oldroser! Submitted by noner on Sun, 06/06/2010 - 10:33. Mine are over south of Lorain Avenue. The roses and lavender are planted in the bed in front of my porch. I forget the names of them but one is white and the other yellow. They were highly fragrant the entire month of May - such a delight! I'm on my way there now to do some pruning and I think I have 6 or 7 weeds desperately trying to grow. I'll put them out of their misery! Submitted by Norm Roulet on Sun, 06/06/2010 - 10:39. Submitted by noner on Thu, 03/24/2011 - 19:42. Submitted by Gone Fishin on Mon, 06/07/2010 - 17:34.
from your yard or did you raid the oldroser's yard? Submitted by Gone Fishin on Mon, 06/07/2010 - 17:55. Submitted by Norm Roulet on Tue, 06/08/2010 - 15:41. Submitted by noner on Tue, 06/08/2010 - 16:45.
i forget the header dimensions, but how is this? Sweeet! Can I get that in a 1000x200? Submitted by Norm Roulet on Tue, 06/08/2010 - 16:51. Can I get that in a 1000x200? Submitted by noner on Tue, 06/08/2010 - 17:32.
can you make it fit? Submitted by Norm Roulet on Tue, 06/08/2010 - 18:19. Submitted by Gone Fishin on Tue, 06/08/2010 - 18:51. Submitted by mathew4513 on Fri, 04/01/2011 - 02:34. Submitted by noner on Thu, 03/24/2011 - 19:43. Submitted by Gone Fishin on Tue, 06/08/2010 - 18:59. Submitted by jerleen1 on Tue, 06/08/2010 - 20:35. I think I'll try printing it off, transferring it to some fabric and making it a pillow case border. Submitted by westward on Tue, 06/08/2010 - 23:17.
thank you, Debra and Norm. It is nice to see beauty on occasion. Submitted by westward on Sat, 06/12/2010 - 00:25.
the banana nut muffin is ok for the squirrel, but I wouldn't give her the chocolate chip muffins. Chocolate is not good for animal friends, even the rodents. Submitted by jerleen1 on Sat, 06/12/2010 - 00:55. I don't give her the chips - just the bread part. I also make sure to include a lot of foods high in calcium. Submitted by westward on Sat, 06/19/2010 - 13:16.
another system, another bird feeder destroyed. I will give up and face the fact that this rodent has bested me. WELCOME TO RN, "ALLENWOOD"...real or spam? Submitted by ANGELnWard14 on Sun, 01/30/2011 - 01:13.